Our practice is dedicated to serving our pet community with complete health care including: preventative and wellness care, microchip placement, radiology, general surgery & dentistry. We offer senior wellness and basic wellness testing. Early detection has rewards for both owners and pets. Laboratory testing provides a vital role in early detection and changes in your pet's health. Hernando Animal Hospital was founded by Dr. Mark Griswold in 1980. We have since established a dynamic veterinary team, devoted to celebrating the human-animal bond, by providing our patients with excellent care, as well as providing our clients with the education they need to care for their pets. We are a 1 doctor small animal hospital located in Spring Hill, Florida. We have a dedicated and compassionate staff. Our practice owner, Dr. Chris Gretzinger, is a 1998 graduate of the University of Pennsylvania. She joined the practice in 2002. We provide routine wellness exams, vaccinations, and laboratory services for cats and dogs. Keeping your pet on year-round flea control is very important in Florida. Using a flea control product may save your pet hours of misery, as well as saving you money in the end. Many cats and dogs are allergic to a flea's bite and may cause them a reaction. 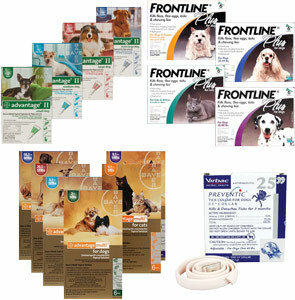 We have many different choices of heartworm prevention and flea and tick control products for our clients, to suit each individual pet's needs. Microchipping is one of the main focuses of lost pet return. 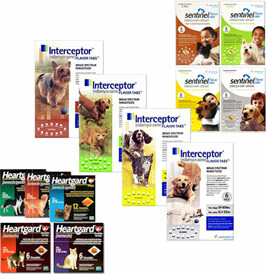 Hernando Animal Hospital uses HomeAgain microchips that are recognized world wide. Placement of the microchip is fast, easy and virtually painless. Good dental health is essential to the general health, well-being, and longevity of your dog's life. Many experts believe that you can add five years on to your pet's life by maintaining good dental health for your pet. Regular checkups will help to keep track of your dog's dental health. Like dogs, cats can suffer from dental diseases including periodontitis. In fact, dental disease is one of the largest causes of health problems in cats. Treatment may include antibiotics, dental cleaning, and extractions, when necessary. Some cats are more prone to plaque, and subsequent dental disease, than others. At Hernando Animal Hospital, every appointment with the doctor includes examining your cat's teeth and mouth, and advising you on good dental care for your pet. 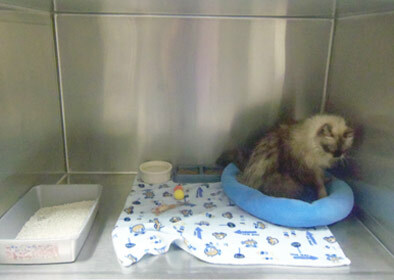 Overnight, daily, weekly, or monthly accommodations are available for our feline patients. Boarding your pets at Hernando Animal Hospital gives you the assurance of having a veterinarian on-hand, if the need arises. We offer Hill's Prescription Diet our hospital to ensure the best nutrition suited for pet's individual needs. In the unfortunate event that your pet passes away, we offer our clients different pet cremation options. Upon your pet receiving the rabies vaccine, you will be given a rabies certificate, which may be used to obtain a county license. 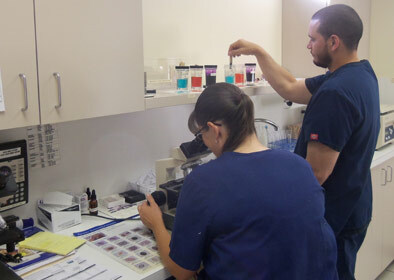 The in-house laboratory at Hernando Animal Hospital is a crucial part of our practice. Tests on blood, urine, stool, or tissue are often critical for determining either illness or health. We have a mobile endoscopy service that comes to our hospital to perform our ultrasounds. We offer the most advanced surgical techniques and technology. 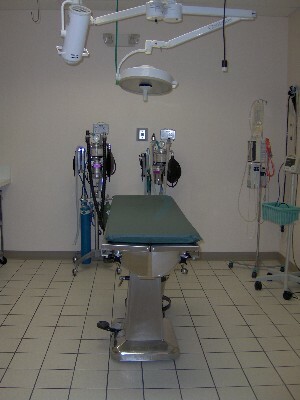 All patients are carefully screened for safety, and anesthetics are specially tailored to your pet. Medical emergencies are seen during our normal office hours. If possible, please call ahead so we may prepare for your pet's arrival, and then proceed directly to our hospital. EMERGENCIES AFTER-HOURS: We advise that you contact the Animal Emergency Clinic of Hernando if you have an emergency while our office is closed at (352) 666-0904. They will fax us a report of your pet's visit, so that we may follow up with you the next day. Please call us at (352) 683-6268 to schedule an appointment for your pet. 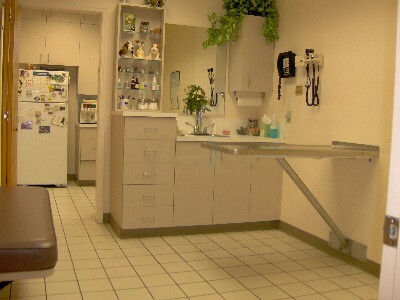 Although patients are seen by appointment only, emergencies do arise and we ask for your understanding in the event you may need to wait to be seen by the veterinarian. Timeliness is a major priority of ours, but above all, is the health and well-being of our patients. Our fees reflect our extraordinary service and expertise at Hernando Animal Hospital. We take pride in having a highly skilled and competent staff who are passionate about each and every pet that enters our hospital. Payments are due in full when services are rendered. We accept cash, personal checks, Visa, Mastercard, Discover, and CareCredit. We would be glad to give you an "estimate" of the charges, to the best of our knowledge, in advance, if you'd like. Prescription Medication: We are forbidden, by law, to sell prescription medications without a physical examination being done on your pet within 1 year. Overnight, daily, weekly, or monthly accommodations are available for our feline patients. Boarding your pets at Hernando Animal Hospital gives you the assurance of having a veterinarian on-hand, if the need arises. Hernando Animal Hospitals indoor, heated boarding facility is cozy and spacious, providing your cat with gentle care from our loving staff. Your pet is fed Hill's Science Diet during their stay, or you may choose to bring your pet's own special diet with them. Special needs will be met on an individual basis. Documentation of current vaccinations is required. Early reservations are encouraged, especially during the busy holiday seasons. Advantage & Frontline - This is a once a month topical solution used for the prevention and treatment of flea infestations in dogs and cats. Comfortis - This is a monthly beef-flavored chewable tablet for dogs used to kill fleas and prevent infestations. Starts killing fleas in 30 minutes. Must be given with a meal. Preventic Tick Collar-This is an adjustable tick collar used for dogs only that last for 3 months. It prevents new ticks from attaching and feeding within 48 hours after application and is water resistant. Heartworm Prevention-Interceptor Flavor Tabs - This is a once a month chewable tablet used to prevent heartworm disease, control adult hookworm infection, and remove and control adult roundworms and whipworms. Heartworm and Flea Control Combination-Sentinel - This is a once a month flavored tablet that prevents heartworm disease and flea populations in dogs. It also controls adult hookworm infections and removes and controls adult roundworm and whipworm infections. Sentinel has no effect on adult fleas but does control flea populations by breaking the flea cycle at the egg stage. It should be given with a meal. 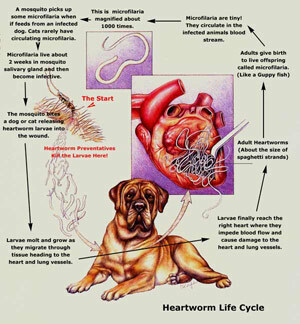 Heartgard - This is a once a month beef flavored chewable used to prevent heartworm disease and to treat and control roundworms and hookworms. Advantage Multi - This is a once a month topical solution used for the prevention of heartworm disease and the treatment and control of hookworms, roundworms, and whipworms in dogs and cats. it also kills adult fleas and can be used for the treatment of flea infestations. Like dogs, cats can suffer from dental diseases including periodontitis. In fact, dental disease is one of the largest causes of health problems in cats. 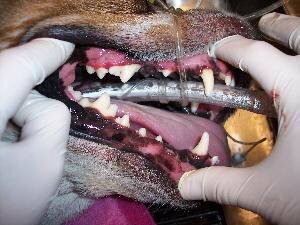 Treatment may include antibiotics, dental cleaning, and extractions, when necessary. Some cats are more prone to plaque, and subsequent dental disease, than others. We use radiographs in a variety of cases. Our in house radiology department allows us to quickly get answers about what may be going on inside a sick or injured animal. 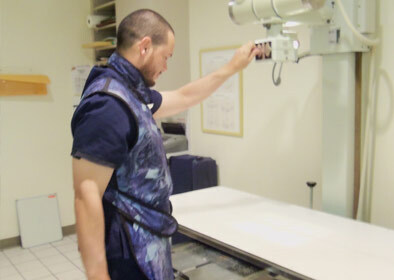 Our technicians position the animal, take the x-ray and develop it while you discuss your pet's case with the doctor. Usually the process takes about 15-20 minutes, start to finish. 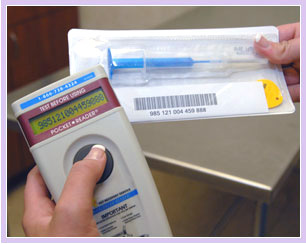 X-rays are important tools for the detection of abnormalities in the size and/or shape of organs, bone fractures, bladder stones, for barium studies, for finding and assessing tumors, or for locating foreign material your pet may have ingested. Radiographs for pregnant patients allow us to see the size and number of fetuses present, and whether or not the expectant mother may be at risk for a cesarean birth. X-rays are also a useful aid in decision-making regarding possible surgery. We provide routine wellness exams, vaccinations, and laboratory services for cats and dogs. We strongly urge our clients to work with us in providing the best veterinary care we can offer. Preventative medicine is important for cats and dogs of all ages. 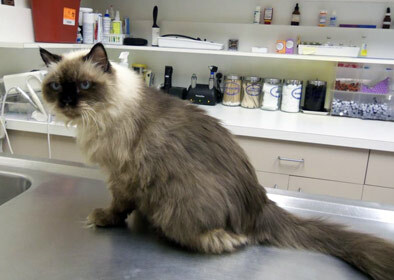 This includes yearly physical exams, vaccines, internal parasite exams, and blood work. Early detection of health problems can ensure prompt treatment, before they can become life threatening. We offer Hill's Prescription Diet in our hospital to ensure the best nutrition suited for pet's individual needs. We offer a wide variety a prescription diets for our feline and canine patients. The Home Again microchip is about the size of a grain of rice, making it easy to be implanted during a routine office visit. In the unfortunate event that your pet passes away, we offer our clients different pet cremation options. Hernando Animal Hospital uses the local pet crematorium, Foster's Pet Cremation Service. They are a family owned and operated business, established in 1987. Through Foster's, we offer group cremation and private cremation. If you would like to have your pet's ashes returned to you, you will be able to choose from a wide variety of urns. Our in-house lab allows our doctors to make a quicker diagnosis because we get results in minutes rather than the many hours or days that sending samples to another lab may require. Having an in-house laboratory means quicker treatment for your pet and faster more efficient monitoring for our sick or surgical patients. Not only does our lab help the doctor care for your pet during your routine or diagnostic appointment, our pre-surgical blood analysis provides an extra measure of safety should surgery be necessary for your pet. We often perform laboratory tests to check organ function and determine the best way to prepare each animal for surgery. Hernando Animal Hospital believes in the importance of diagnostic testing in providing the best care for your pet. By having this capability in our facility, we can offer a level of care that your pet (and you) deserve. Our Staff Loves Continuing Education! All of our staff recieves continuing education on a regular basis, to stay informed on all the latest veterinary news and updates! Dr. Chris Gretzinger is a 1998 graduate of the University of Pennsylvania. She joined Hernando Animal Hospital in 2002 as Dr. Griswold's associate and staff surgeon. She enjoys spending her free time with her son, Jonathan, as well as gardening and raising butterflies. Ruth is originally from Simburg, CT. She moved to Spring Hill in 1992 and joined our team as a receptionist. She is now the office manager and loves interacting with clients and patients. Ruth will always have time to speak with you before or after your visit about any concerns you may have. While not at work, Ruth enjoys playing with her Shih Tzu, Maddie, which the staff has nicknamed the "Princess"! During your visit at Hernando Animal Hospital, you will see her photo proudly displayed with the rest of the staff's childern and grandchildren! Janet worked for Hernando Animal Hospital as a veterinary techincian from June of 1993 to March of 2001. She continued working in this profession for the next 11 years and rejoined us in Jan. 2012. When she is not working she enjoys spending time with her husband and 5 cats. Heather has been a veterinary technician at our hospital since May 2002. She is also cross-trained as a receptionist. She has fostered many animals, including wildlife, in the years she's been with us. She has a yorkie named Mocha. She has 2 daughters. In Heather's spare time, she enjoys outdoor activities with her family. Stephanie started at Hernando Animal Hospital as a receptionist in April 2007. She has 2 cats, Chloe and Joey, and a son named Mikey. She graduated PHCC as a Health Unit Coordinator and Monitor Tech in 2004. Marina joined our practice as a receptionist in April 2010. She is originally from Brooklyn,New York. Marina has a Blue nose Pitbull named Denaro & a son named Carmine. Marina is now working as a technician since 2012. Paul joined the Hernando Animal Hospital in January of 2000 and is responsbile for the cleaning and maintence of the facility.